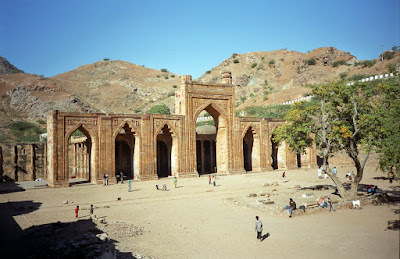 Dhai Din Ka Jhonpra, Ajmer: Adhai or Dhai Din Ka Jhonpra Ajmer is a superb example of Indo-Islamic architecture. It is believed that it was constructed in two and a half days, hence called as Adhai-Din (two and a half days). It is also believed that the name is associated to a two and a half day fair held annually nearby. The mosque was originally a Sanskrit college but later on converted into a mosque by Muhammad Ghori in 1198. He erected seven arched-wall engraved with verses from the Koran.